VISTA, CA and SANTA CLARA, CA--(Marketwire - October 28, 2009) - Ultra Communications, a leader in the development of high performance fiber optic transceivers for harsh environments, announced today the successful release of radiation hardened integrated circuits for next generation fiber optic transceiver applications. The circuits were designed in a single pass using the EDA tool flow and Process Design Kits (PDKs) from Simucad, a leading provider of Analog, Mixed-Signal and RF Electronic Design Automation (EDA) tools. The designs were manufactured at Jazz Semiconductor (Newport Beach, CA) and have been characterized for pre and post radiation response for use in defense applications. "Simucad's EDA tool flow and their support for Hardened-By-Design architecture is crucial to our success. The SmartSpice RadHard simulator also provided us with excellent predictive results for designing integrated circuits for multi-gigabit hardened fiber optic transceivers," said Joe Ahadian, Vice President of Engineering at Ultra Communications. "We were able to match Total Ionizing Dose radiation test results to our SmartSpice RadHard simulations and explore the design corners and their influence on radiation response in simulation with confidence." "Simucad's front end tools, Gateway and SmartSpice, together with the back end tools Expert, Guardian, and HIPEX, provide a very affordable and complete radiation hardened design flow," said Dr Ivan Pesic, President and CEO of Simucad. "Our support for organizations like Ultra Communications, and their important work for our military, has been a long term commitment from Simucad and this will continue to be our key focus." The designs for this effort were supported by The United States Air Force Research Laboratories (AFRL) Space Vehicles Directorate at Kirtland, AFB through their Systematic Hierarchal Approach for Radiation hardened Electronics (SHARE) program. SHARE's objective was to deliver affordable EDA tools, matched with design kits, to facilitate access to onshore foundries like Jazz Semiconductor and American Semiconductor (Boise, ID). The prime contractor for the SHARE effort was L-3 Communications Electromagnetics & Electronics Division (San Diego, CA). 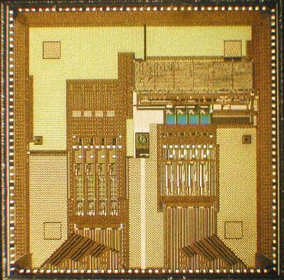 "The SHARE program was an outstanding collaboration between multiple US-based integrated circuit design teams, the US Government, and Simucad to develop a predictive suite of capabilities for the modeling of radiation effects at domestic foundries," said Chuck Tabbert, Vice President Sales and Marketing for Ultra Communications. "The Simucad Process Design Kits and affordable toolset allows small business design teams to compete on a level playing field in the radiation hardened integrated circuit design space. This enables Ultra Communications to access smaller geometry technologies which support our roadmap to 100Gb/sec and above transceiver products for integrated battlefield networks in both terrestrial and space applications." "Simucad has over twenty years of experience in developing radiation hardened technology," said Mark Maurer, Manager of Simucad's Government Business Division. "We developed SmartSpice RadHard in response to our customers in the Department of Defense, Department of Energy, contractor community, and other Government agencies. SmartSpice RadHard fulfills their requirements to simulate the most complex analog/RF/mixed-signal circuit, cell, and full chip designs across a spectrum of radiation environments from near space to nuclear weapons with confidence. The ability to accurately model single event effects, total dose, dose rate, prompt dose, and combined environment simulations with no changes to the foundry supplied model cards and PDKs is an outstanding capability for our customers." SmartSpice RadHard is exclusively available to US-based defense contractors, US Government agencies, and research laboratories that qualify for access under ITAR regulations. Ultra Communications (UltraComm) supplies highly compact and robust photonic components for harsh environment applications, such as satellites, military airframes, UAV, missiles and cell phone base station applications. We have developed a hybrid IC and optoelectronic integration approach that features: Standard planar manufacturing of photonic packages, Single chip integration of multiple functions -- transmitters, receivers and built-in-test, high speed digital (10 Gbps) or RF photonic components, ability to optically monitor Vertical Cavity Surface Emitter Lasers (VCSEL) on a per-channel basis, and operation over a wide temperature range and in radiation environments. Ultra Communications is headquartered in Vista, California (in the greater San Diego area). Additional information is available on the web at www.ultracomm-inc.com. The Ultra Communications name and logo are registered trademarks of Ultra Communications Incorporated.